Manganese plays a role in many key bodily functions. It helps with energy production and normal bone formation and development. It also aids in the synthesis of many vital cellular bio-chemicals such as collagen, fatty acids and proteins. Add to this an important role in one of the body's main antioxidant systems and you have a trace mineral supplement of some importance. 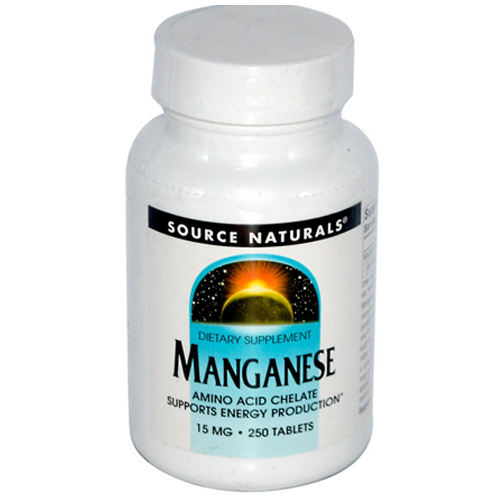 The manganese in Source Naturals Tablets is chelated (specially bonded) with amino acids to protect it's mineral value and help with assimilation. Contains no yeast, dairy, egg, gluten, soy or wheat. Contains no sugar, salt, preservatives, or artificial colour, flavour or fragrance. Solgar Chelated Manganese Tablets from Eden Nuganics are made using an advanced patented process creating a manganese supplement suitable for bone, joint and nerve health. Bluebonnet Nutrition Chelated Manganese uses superior Albion Amino Acid Chelate to provide a fully reacted manganese bisglycinate supplement in easy to assimilate capsule form.